This document considers various topics of astronomic scope and rationalises seemingly-anomalous but interesting physical phenomena of the STAR WARS galaxy. This page is intended to address a miscellany of concerns about the scale of the STAR WARS setting, the technological scope and scale of Emperor Palpatine's civilisation, as well as rationalising some puzzling and commonly misunderstood problems with the mundane physics of STAR WARS . Andrew for suggesting refinements to the comments on the rendezvous-point object. Reed Bowman for identifying the decisive radio play reference that explains the "sound in space" effect. Robert Brown for abundant discussion; for the galactic map from Behind the Magic . Kevin Casto for the SWRPG2 quote regarding the galactic population and worlds. George Comstock for pointing out that the rendezvous-point object is much brighter than a galaxy ought to be. Ann C. Crispin for prompting discussion of the physics of Nal Hutta and Nar Shaddaa. Kevin Dole suggested the identification of the asteroid field with a giant planet called Anoat. Adam Gehrls for scans and remarks about the Vector Prime map. Frank Gerratana for discussion of the brownish object near Endor; and for various images. Silas Haughton suggested that the spiral object at the end of TESB might be excreting rather than accreting. Erick Herlitz for a version of the Vector Prime map. Michael Allen Horne suggested consideration of galactic catastrophes, and the possible need of a regalar interstellar evacuation force; also pointed to the significance of the possibly expanding/contracting Galactic Senate chamber and saucer configuration. kmoon for suggestions and observations regarding the mysterious white glob in TESB , and the possible stripping of the Endorian atmosphere. Shay Pierce for the galactic map from Rebellion . Ethan Platten for abundant discussion. Wayne Poe for the CINEFEX and The Cosmic Mind Boggling Book references regarding the mysterious object visible from the rebel rendezvous point. Tyler Saxton for the use of his video digitiser. 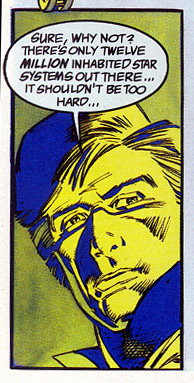 Luke Shadrosky pointed out the presence of the Endor planet in the Aurra Sing comic. Jay Shepard pointed out the Visual Dictionary estimate of the saucer capacity of the main Senate chamber. Krister Sundelin for the shield resonance theory of "sound in space". Daniel Wallace for discussion and for inadvertently reminding me to complete this page; for qualifications and extensive debate about the Vector Prime map, though I am not convinced by his concept of a shrunken Empire. Michael Wong for the Naboo quote from Behind the Magic ; for the population density of Hong Kong. Brian Young pointed out Rieekan's remarks about meteor activity. The galaxy successively governed by the Galactic Republic, Palpatine's Empire and the New Republic was a typical spiral galaxy consisting of several hundred billion stars. According to Lando Calrissian in Shield of Lies ( p.39 ) the galactic disk is 120,000 light years in diameter. According to the musings of Boba Fett in Tales of the Bounty Hunters , there are of the order of a hundred billion star systems and twenty million intelligent species. A hundred billion star systems is typical of a galaxy of this size, and the total number of stars would be somewhat larger since a majority of stars are in binary or multiple systems. According to Dark Empire there are over twelve million inhabited systems. Most other references are less specific, including only vague notions of "a thousand thousand worlds." In agreement with Grand Moff Tarkin's statement about the Empire's membership [ A New Hope , p.116], The STAR WARS Roleplaying Game Second Edition [p.126] indicates over a million "member worlds", supplemented by "colonies, protectorates and governorships" amounting to "nearly fifty million systems." The member worlds presumably are the only ones directly represented in galactic institutions. The book also states that the total sapient population is only about 100 quadrillion beings, meaning 1017 or 1026 depending on whether the colloquial or traditional interpretation is used. This seems remarkably low (and is perhaps unrealistic) considering the number of worlds, and the resources of barren systems that can feed them. Han Solo comments on the range of inhabited worlds where the lost Jedi Master might be found. The map of the galaxy from Behind the Magic shows it to be a spiral much like the Milky Way. In Vision of the Future a hologram of the galaxy is described, showing territories of unknown threats surrounding the regular regions of space. The contentious part of this scene is that one possible reading of the text implies that the known regions of the galaxy constitute less than a majority of the galactic disk, which essentially and explicitly contradicts all other published statements of galactic scope, including those in earlier Zahn novels like Heir to the Empire [wherein Leia complains that only three-quarters of the galaxy is under New Republic control, with the rest being in the hands of the Imperial remnants]; and the movies, which indicate that virtually the whole galaxy is known and traversable ["they could be on the other side of the galaxy by now"... "I've flown from one side of this galaxy to the other..."] This cannot be the correct interpretation. Clearly, by their name and by the explicit graphics of Behind the Magic , the "Outer Rim Territories" are the margins of the Galactic Empire and the Old and New Republics, and the physical edge of the galactic disk. It is also clear that the Outer Rim encompasses the entire circumferential egde. The Corporate Sector, an anomalously rich region in the Outer Rim, is explicitly placed on the far tip of a spiral arm in Han Solo at Star's End . Therefore the Unknown Regions are not part of the galactic disk. However a spiral galaxy doesn't end abruptly, and there is diffuse formless material and occasional stars, stellar remnants and globular star clusters scattered in a spherical halo of space surrounding the disk, even above the main galactic plane. Dark matter in the halo constitutes most of the galactic mass; although mysterious to our science, it should be innocuous old knowledge to a galactic civilisation. Few of the complacent people of the greater galaxy would bother to stray from their tens-of-millennia-old trade routes to visit these spaces beyond the disk, because the distances are so vast and the destinations so scarce. Chemical considerations make planets unlikely or uncommon in globular clusters, even though these associations of millions of stars must have high abundances of interesting power sources like exotic stellar corpses. In total the halo would still contain millions of interesting destinations but because they're spread across space much larger than the disk, it wouldn't be economical to establish trade routes so far out. This zone is probably what constitutes the Unknown Regions and Wild Space. These regions may have an unusually large concentration of naval and military power, (in the hands of secretive rogue species like the Nagai, Tofs, Ssi-Ruuk and Chiss) but very few inhabited systems compared to the galaxy at large. Indeed the conditions of these sparse interstellar badlands might actually encourage spacefaring locals towards aggression. If this is how the Unknown Regions are defined billions of stars spread out over a vast space several times the diameter of the galactic disk, compared with hundreds of billions of stars in the conventional part of the galaxy. That's plenty of interesting places for stories, and it's remote enough to explain why it's rarely visited. 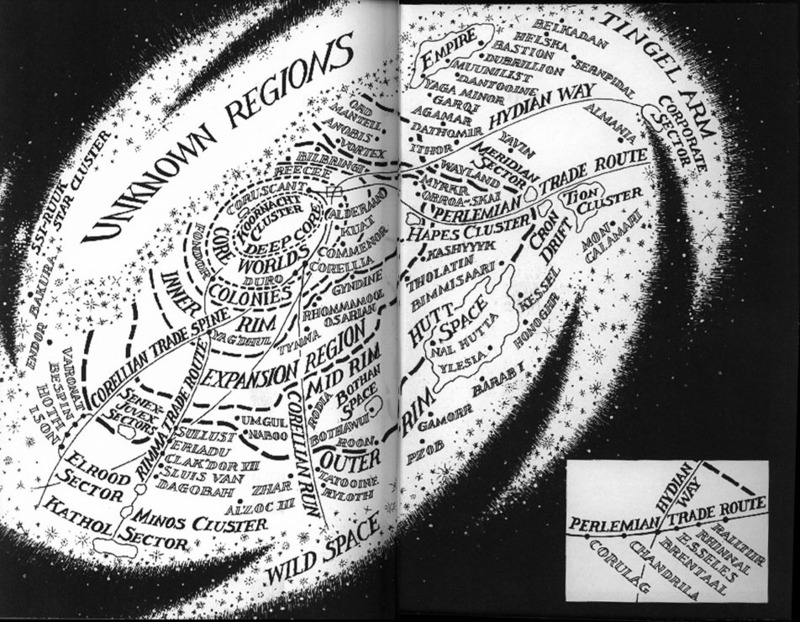 The interpretation of a drawing of the galaxy in Vector Prime also raises controversy over the nature of the Unknown Regions. The problematic part of the diagram is the label "unknown regions" appearing above part of the galactic disk. Spiral galaxies do not suffer physical discontinuities that could possibly restrict interstellar exploration and settlement in a special band of longitude. Probe droids are cheap in galactic terms, and amateur astronomy is even cheaper. The deliberate and accidental emissions of galactic civilisation are readily detectiable to all civilisations emerging within the galactic disk, even before they achieve reliable space travel. Reciprocally, such civilisations are readily observable by agencies of the Galactic Republic. In all the tens and hundreds of thousands of years of galactic civilization, the entire disk must have been visited, with only local pockets left aside due to disinterest. Even the use of relativistic sublight travel (eg. the journey from Anoat to Bespin in The Empire Strikes Back ) is adequate for colonists to reach all corners of the galaxy during the known history of Coruscant. The Vector Prime can be rationlised. The physically and textually awkward interpretation (involving an inexcusably large unexplored region within the disk) is only one of several ways of reading the art. Firstly, we must remember that the map does not purport to be a complete or perfectly scaled version of the galaxy. It portrays the topology of some (but not all) important trade routes, and it concentrates on systems that are already known in the literature. Absence of a feature on this map does not disprove its existence in the STAR WARS galaxy. Secondly, the map is a projection of a tilted three-dimensional structure. The labelled "unknown regions" may be in the galactic halo between the disk and the artist's point of view; ie. above and surrounding the main galactic plane. 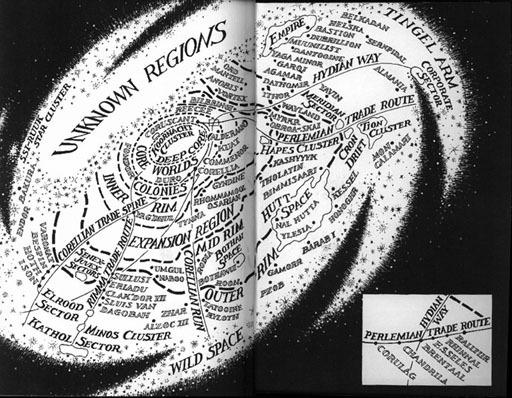 This geometric explanation also reconciles the placement of the label "Wild Space" opposite the "Unknown Regions" (which occurs despite the fact that these spaces are consecutive and concentric in the previous STAR WARS literature). As less obvious alternative is to suppose that each of the star-like marks is a region of wild space within the Outer Rim Territories etc. Large- and small-sized scans of the Vector Prime map, an oblique projection with some inhabited systems and regions marked. The map of the galaxy from Behind the Magic clearly shows that the Outer Rim Territories are the physical fringe of the galactic disk. 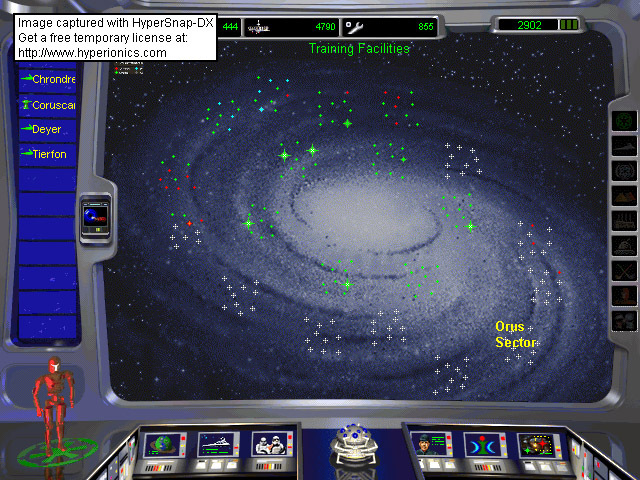 The galactic map used in Rebellion shows known and occupied systems throughout the disk. Under successive galactic governments territories known as "sectors" remained the most important unit for the purpose of regional government. At the peak of Emperor Palpatine's Galactic Empire the sectors were ruled directly by their military governors, the Moffs and Grand Moffs, who answered to Palpatine's advisers or to the great despot himself. Under the previous regime of the Galactic Republic, and its restored post-Palpatine incarnation (the "New Republic"), the military was subordinate to the Imperial Senate, which consisted of political representatives (senators) elected from the sectors. Each sector consists of several hundreds or thousands of inhabited systems. However the fraction of all stars actually possessing a hospitable world is so low, approximately one in ten thousand, that a typical sector will contain millions of barren stars as well. The typical separation of permanently settled systems must be dozens to hundreds of light years. The night sky seen from the surface of a typical inhabited world shows only about two thousand stars visible to the naked human eye. In most parts of the galaxy a planet must be considered fortunate if there is another habitable star system near enough to appear as even a mere point of light to the casual stargazer. Sectors are defined for administrative practicality, and presumably in accordance with trade and local cultural affinities. The number of settled worlds in a sector, and their inter-relationships through trade will be the dominant constraints on the definition of particular sectors, and not strict geometry. Sector boundaries are not defined as regularly shaped surfaces, nor are the total volumes of sectors fixed by any rigid universal criteria. Compared to Core sectors, sectors in poorly-settled regions of the galaxy might be more voluminous but a similar number of colonised planets. The major constraint is that sectors should enclose comparable numbers of populated worlds. The scope of the galactic civilisation is exposed in its central institutions, such as the Galactic Senate. 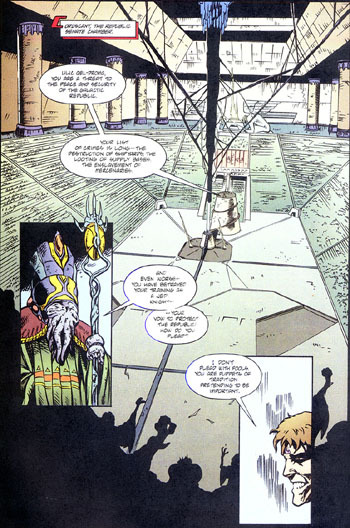 Various Senate halls were seen in Tales of the Jedi comics and The Phantom Menace trailer. Each of these chambers is a conical stadium-like room with a chairman's or speaker's tower in the centre and senators seated in the concentric rows. If each inhabited system had a senator present then there would be millions of them. This may have been the case in the larger assemblies of Tales of the Jedi , especially for the trial of Ulic Qel-Droma. On the other hand sector-based political representation requires only some thousands or tens of thousands of senators, considering the fact that each sector has a number of inhabited worlds on the order of hundreds or thousands. (Taking the Dark Empire estimate, there would be about twelve thousand senators.) The senators might not necessarily all be present in the chamber at once; disinterest, holographic telepresence, a refined system of proxy voting or a roster of seating rights might account for scenes in which Senate attendance is lower than the expected ideal. The Main Senate Chamber shown in The Phantom Menace trailer seems to be a modular arrangement of mobile saucer platforms parked so as to eliminate gaps. It is interesting to speculate about whether the chamber itself conforms physically when a greater proportion of the senators attend, perhaps with the number of saucer rings expanding and maybe an upwards telescopic extension of the central tower. Online documentation at the STAR WARS Official Site confirms that this chamber is indeed a domain of sectorial senators like Senator Palpatine of Naboo, and the site further states that there over a thousand senators present at once. ( Episode I: Visual Dictionary suggests that the number is 1024.) Palpatine represented hundreds of worlds [ Official Site , Episode I Scrapbok ] in a provincial sector, including his homeworld of Naboo. The movie does not show the top of the chamber, but there are at least seventeen rings of saucers. 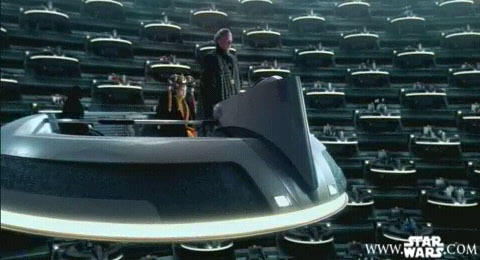 The Galactic Senate hall seen in The Sith War was a vast stadium-like chamber with possibly millions of senators sitting on benches. (This suggests that representation for Qel-Droma's trial was system-based rather than sectorial.) There are two speaker's towers like those in The Phantom Menace , but the dominant building materials are stone rather than metal and plastic. A chamber of the Galactic Senate. If each of the platform saucers holds only one senator and if all senators are present simultaneously then the chamber ideally ought to extend for a few dozen rings beyond the fourteen visible rings (because the visible portions can only hold several hundred saucers). NB. the fact that the saucers hold more than one person does not mean that all of those people are senators. In the case of Palpatine's saucer there were at least several aides and other passengers, including Queen Amidala, who were not senators. Closeup of one of the saucers in mid-air, proving its mobility. Queen Amidala is seated in front of a hooded figure, and Senator Palpatine is at the bow. Eleven saucer rows are visible in this shot. Planetary systems appearing in most STAR WARS stories are not representative of the whole galaxy. Several important selection effects are in action. Certain types of systems are more likely to feature in stories than others. The gamemaster will only want to send players to interesting planets and systems. The odds of this game system are heavily weighted toward generating advanced or colonised planets. The civilisations of the Star Wars universe have been spacefaring for so many centuries that most advanced civilisations (and a lot of primitive ones as well) have been discovered and assimilated into galactic culture. There are isolated sections of the galaxy that offer undiscovered civilisations and other challenges, and they can also be generated with this system. They can exist for whatever reason: they are far out on the end of a spiral arm; or, they are difficult to get to because they are surrounded by gas clouds, near rogue planets or subjected to huge ion storms. There is a systematic bias against the most grandiose and immensely populated planets as well, since such settings tend to be too huge to be swayed by the actions of any small group of (roleplaying) characters, no matter how heroic. Refer to the section about population. There is one residual problem of planetary realism in existing STAR WARS fiction which is not easily explained by the selection effects of the storytelling process. In many SW:RPG references the inhabited worlds are described along with a brief supplemental listing of other bodies in the same system. Even a casual glance at these profiles reveals a striking poverty of sibling worlds. If they can be believed, most systems in the Galactic Empire contain roughly half the number of worlds known in our own real solar system. Scientifically there is no reason to suspect that our system is atypical. Therefore a realistic sample of fictional planetary systems would be broadly comparable in composition, and the average number of planets should be similar. The underpopulation of STAR WARS planetary systems seen to date can probably only be attributed to a lapse of creativity. It may be due to an unwillingness to invest in the effort of devising names for peripheral worlds which are individually unlikely to feature in any adventure. In any case, it is to be hoped that this trend will be soon corrected. 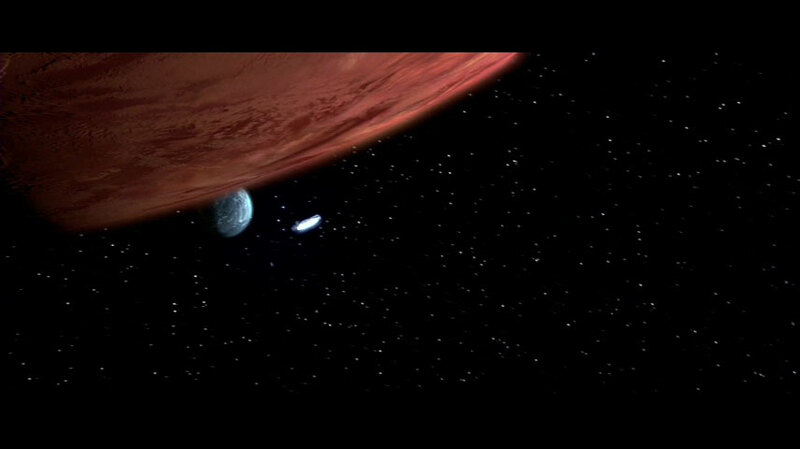 Many of the life-supporting worlds of STAR WARS are moons of larger planets. 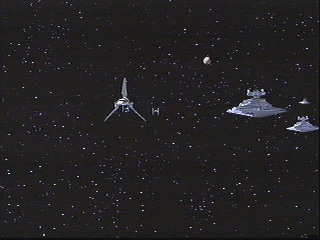 Yavin, Panna and Endor are gas-giants which are parents to inhabited moons in A New Hope , the STAR WARS Holiday Special cartoon and Return of the Jedi . At first glance the abundance of this situation seems to constitute a remarkable bias. The conditions under which gas-giant planets originate seem also to be conducive to the formation of numerous satellites. In our solar system every gas-giant has a large number of moons. A few of these moons are the size of small terrestrial planets, though not quite big enough to be habitable. Unfortunately they're also much too far from the Sun's warmth for life. There may be systems where a gas-giant planet orbits close enough to its sun for its moons to experience temperature conditions favourable to life. Indeed an abundance of close-orbiting gas-giant planets have been detected in real planetary systems discovered in recent years. Some orbit their suns more closely than Mercury does our Sun. It seems plausible that many planetary systems will feature giant planets orbiting at temperate distances. The largest satellites of some such planets might have sufficient gravity to hold a respectable atmosphere and hospitable climate. The factors determining the maximum mass of moons around a particular gas-giant are not well understood. However there does not seem to be anything to prevent the occasional formation of moons with the mass of a habitable planet. Perhaps larger gas-giants might naturally tend to have larger moons, or else different conditions of the protoplanetary disks of individual stars might determine the final characteristic moon masses. Because gas-giants tend to have dozens of satellites the galaxy might actually contain greater numbers of habitable moons than lone Earth-like habitable planets. Considering this, the abundance of massive life-bearing moons in STAR WARS is quite plausible after all. 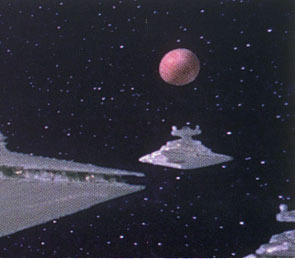 The Millennium Falcon passes the gas-giant Yavin, heading for the verdant fourth moon. The Millennium Falcon rests in mud on a moon of Panna, with the planet and another moon looming in the sky. The gas giant planet Endor as it was seen in the sky of its forested moon, before the planet and satellite parted ways. The Galactic Empire generates and expends energy at rates which can scarcely be overstated. It has technologies to terraform or destroy planets. It is able to construct habitable space structures of at least the size of moons. Wholly artificial planets are built on occasion [ The Crystal Star ]. Even a single routine hyperjump by a star destroyer is said to exceed the domestic energy consumption of entire civilised planets over all of history. Fortunately, hyperdrive travel provides access to natural power sources which vastly supersede those available to planet-bound societies. Interstellar mobility permits engineers to visit stellar and interstellar phenomena which could serve as stupendous energy resources. The classical notion of the Dyson sphere involves the complete englobement of a star to capture all of its radiant energy. It is not yet known whether Imperial technology has reached this capability, but several classes of compact degenerate stellar remnants are more amenable to this purpose. Bizarre celestial bodies like pulsars and black holes are starlike in their masses and other attributes, but they are compressed to diameters of only a few kilometres. The Empire's mastery of gravitics and construction of multi-mile space facilities permits the encapsulation of these objects with power-extraction machinery. In the case of some ordinary neutron stars the engineers might be content simply to construct devices to capture radiant energies. The devices exploiting these objects would operate like a miniature Dyson sphere, with photoelectric systems and/or heat engines between the hot interior and the cool surrounding space. In other cases the extraction of rotational energy is most desirable. A device which couples to the spin of the stellar object can derive power at the expense of slowing the star's rotation. The rate of extraction necessary to sate human needs will probably be too small to slow the source significantly over the mere tens of millennia of galactic history. In cases where the source has a strong magnetic field, a magneto effect would siphon off the rotational energy. Generators built around pulsars will depend primarily upon these magnetoelectric mechanisms. A black hole lacks magnetism, but there are other ways to exploit its rotation. Near its surface, space itself is dragged around as the hole spins. Objects located sufficiently close to the hole cannot move in any sense other than that of the general spin. A projectile or light beam sent on a carefully-chosen path through this zone (known as the ergosphere) can deliver an enormous amount of energy when it returns to the inner skin of the power extractor. Via these and other means, the Galactic Empire must have access to virtually limitless natural energy resources. If the power can be efficiently distributed then Palpatine's civilisation has at its disposal the magnitude of energy, though not necessarily the technological means, to disrupt the substance of a star. Therefore the Death Star is not revolutionary so much for the power it expends as for the fact that such a wealth of energy is concentrated and devoted to a single weapons system, rather than the sustenance of the hyperdrives of a starfleet or the industries and domestic appliances of numerous inhabited worlds. Since the resources of its entire galaxy were harnessed long ago in the forgotten prehistory of the Old Republic, the only serious limitations on the Empire's engineering accomplishments are matters of political decisiveness, human ingenuity and organisation. The Galactic Empire contains twelve million worlds inhabited by intelligent beings. Among the hundreds of billions of stars in the galaxy, most systems are uninhabited. The barren systems are still rich in mineral and other natural resources. These are what supports the galaxy's immense population. A civilisation existing on a single homeworld can only sustain a population of several billion human-like creatures at once, due to environmental constraints. With the resources of millions of barren worlds supporting each inhabited planet of the Galactic Empire, planetary populations could comfortably grow to trillions on any particular world. Raw materials and foodstuffs could be imported in arbitrarily vast amounts, and the empty wastes of space and dead worlds allow for indefinite waste disposal. Strangely though, the planet generation rules in Planets of the Galaxy Volume One are radically biased against planets of high population. Most worlds generated with this system have populations on the scale of mere millions of intelligent beings. We must invoke selection effects to explain this. The rules are meant to produce settings appropriate for roleplaying game sessions. The greatest ancient Core worlds, each with trillions of inhabitants, are probably too huge for a small band of heroes to influence. Only battles on an immense scale could affect the fates of these worlds. These events are impractically large for gamemasters and players to resolve in detail within mere roleplaying game sessions. Although high-population worlds are probably common and important in the Galactic Empire, they are generally beyond the scope of interest of the STAR WARS Roleplaying Game . Most of the action in the STAR WARS trilogy and spin-off fiction necessarily takes place in remote regions on the fringes of the Empire, where the guerilla forces of the Rebel Alliance could move and operate with relative impunity. This has the unfortunate side-effect that we have seen little of the most civilised regions of the galaxy, and we have little idea of the scope of the technological and cultural features of the worlds which typify the civilisation. One of the few respectable worlds glimpsed so far is the capital of the galaxy, Coruscant, whose name is derived from the verb "coruscate" meaning to shine like a jewel. 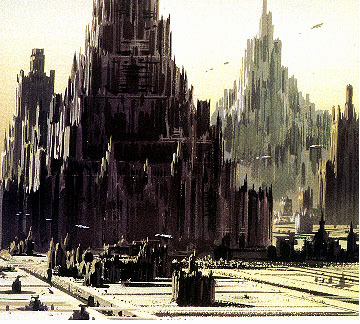 Coruscant, site of Imperial City, is said to be the pinnacle of galactic civilisation. There are probably many worlds which are either more populous, culturally advanced or wealthy, but Coruscant is understood to be the greatest combination of all three attributes. Other examples include the seedy city-planet Axxila from X-Wing Rogue Squadron #30,31 , and Corulag which is shown to be at least partially city-clad in orbital views in Shadow Stalker . The Dark Empire Sorucebook [p.76] mentions several Coruscant-like planets: "Coruscant, Alsakan, Grizmallt, Wukkar and a host of the most heavily populated worlds surrendered to Admiral Ackbar's fleet." 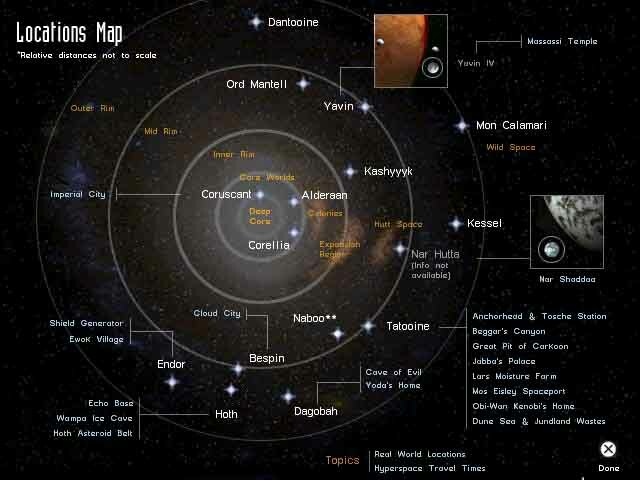 In addition the conditions of Coruscant can be taken as characteristic of most planets in its Core Worlds region, and as a yardstick for the worlds of less developed regions. A year after the events surrounding the return of Grand Admiral Thrawn, large sections of Imperial City were laid waste during the Imperial recapture of the capital world. This accomplishment ignited long-dormant feuds as various Imperial factions struggled for power. During the Mutiny of forces loyal to the Moffs and Grand Moffs against the later Emperor's Inner Circle, vast sections of the cosmopolis were devastated, at least superficially. Disruption of environmental systems rendered the atmosphere difficult or unhealthy to breathe for humans without gas masks. Most of the permanent and temporary residents fled. Further devastation was wrought by a horrendous Force storm — an abominable, roiling disruption of spacetime — inflicted by one of the Palpatine clones in Dark Empire . Once the resurgent Imperial Forces were defeated and scattered again, the New Republic resumed control over the planet. Damage to the city superstructure, including the demolition of portions of the Imperial Palace, proved reparable, with the aid of countless numbers of the city's gigantic construction droids. These enormous automatons lumber across the landscape, devouring old buildings, reprocessing the raw materials via internal factories and leaving a trail of gleaming new spires behind. Within a few years the destruction had been erased, at least from the vital governmental centres. Much of the population returned and the business of administering the galaxy resumed. Imperial City and Coruscant proved too stupendous in scale to be perturbed by the passage of wars and governments. In Before the Storm Luke Skywalker rebuilt and repaired one of his father's private castles on Coruscant as a place for solitude and meditation. The fortress was structured so that its presence would be visually disguised in the red rocky cliff face of a seashore several kilometres to the west of the Manarai Mountains. The presence of a beach seems to be in conflict with the usual assumption of complete global urbanisation. However it is noted that this particular region suffered terrible damage during the battles for Coruscant. The damage inflicted during the capture and recapture of the planet is known to have laid waste to huge areas of the city. Perhaps the oceans were always present at the foundations of the miles-high spires, and they only became fully exposed near Vader's castle when that region of the city was devastated. A planet-wide city does not exclude seas hidden at the foundation level. All evidence indicates that the [pre- Dark Empire ] surface of Coruscant was entirely covered with city, except for small polar caps and tiny isolated seas. The orbital views in The Phantom Menace show consistent and well-lit urban terrain at essentially all latitudes. Supposing that the cityscape amounts to 90% of the global surface, and assuming that the planet is about the same size as Earth, this means an area of about 460,000,000 km². (This is a miserly, worst-case estimate, since the physical characteristics of Coruscant derived from other sources make it larger than Earth.) The typical population density for suburban areas of modern cities on Earth are of an order of magnitude about 10,000 or 20,000 persons per square kilometre (taking the comfortable Australian city of Perth* as an example). (Readers who would prefer a USA example could consider New York county, with a 1999 population of 1,551,844 persons, an area of 28 square miles = 72.5km², and a population density of 21,107 persons/km² after metric conversion. Reputedly the densest urban population centre on Earth, Hong Kong, had 98,000 persons/km² in 1999 and remains less built-up than Coruscant by some orders of magnitude.) If Imperial City were only as heavily populated as the solid areas of Perth then the population would be of the order of nine trillion persons. Of course Imperial city is not inhabited in the same way as Perth. These suburbs consist almost entirely of single-level buildings and generous gardens around each family dwelling; Imperial City is composed of spires averaging two miles tall, with hundreds of floors, and very few residents ever set eyes on the soil of their planet. The population density of Imperial City is certainly at least several hundred times that of Perth. The total population of Coruscant must be at least of the order of several thousand trillion (1,000,000,000,000,000), and certainly no less than several hundred trillion. Various references from West End Games have given wildly implausible underestimates of Coruscant's population. Heir to the Empire Sourcebook claims that there are only 10 billion inhabitants. The Dark Empire Sourcebook states an even lower figure, but this is believable because at that stage of galactic history the planet was mostly empty and the population evacuated. The STAR WARS Roleplaying Game (second edition, revised and expanded) states a population of only “650 billion” during Palpatine's reign. Unless the term “billion” in this context takes the original definition, (1,000,000,000,000) rather that prevalent in the USA (only 1,000,000,000) even this recently-published population figure must be wrong by a factor of a thousand. The absurdity of this underestimate is easily demonstrated: with a population of only 650 billion and a density of urbanisation equivalent to the simple, single-level cities of Earth, only about 1% of the planet's surface would be city-covered. It is more exceptionally difficult to rationalise the strange population figures quoted in the earlier sourcebooks. Either the tiny “10 billion” figure refers only to some minority elite who have a higher class of citizenship on the capital world, or else the number is simply and irredeemably wrong. The total sky area of the planet is about 5 × 1014 m² (assuming that it is Earth-sized), so even if the daily food freighters are only as large as medium freighters and they all arrive simultaneously by the millions they will still not cover more than a tiny fraction of a percent of the sky. Bigger ships would dominate the sky much less. In practice, ships would not arrive at just one time in the day; recycling technology would be high; many of the imports would arrive via skyhook elevators; and ecosystems would thrive in the dank depths at ground level. 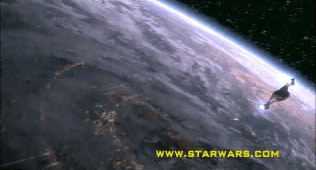 The orbital view of Coruscant seen in the first trailer for The Phantom Menace contains evidence of massive traffic surrounding the city-world. On the horizon, countless moving space vessels give the planet a kind of halo. Since so many of these ships are visible from thousands of kilometres away (and they are more distinct in the cinema version of the trailer) they must be miles in size. * In the map of Perth, take an inner suburb (such as Knightsbridge) which consists almost entirely of buildings without major cavities such as parks and gardens. An inner, mixed residential/business area is a good point for comparison with Coruscant, unlike the central office skyscraper district (which has fewer overnight residents) or the diffuse, outer suburban fringe. Deceptively lower population densities can be contrived by drawing a larger perimeter around Perth, encompassing parks, low-density suburbs, hills, river, bay and other blank areas. These are irrelevant to the layered urban terrain of Coruscant. The grandiose vistas of the upper levels of the Coruscant cityscape are one of the great wonders of the galaxy. Immense buildings two miles tall and hundreds of metres wide may each contain countless thousands of inhabitants. The cavernous mid-levels of Imperial City descend to depths of about two miles, densely populated at all but the lowest and dankest levels. Coruscant (also known as Imperial Centre) as seen from space glitters and shines like a brilliant jewel, due to the refraction and reflection of sunshine off the countless angular surfaces of the city-covered globe. 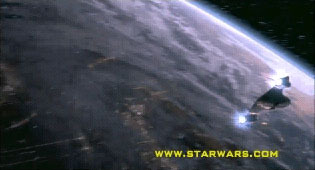 The city-clad globe of Coruscant as seen in the first The Phantom Menace trailer. Since this view of the planet is near the night/day line, either local dawn or dusk, the sunshine refracts and reflects off the city surface at very oblique angles. The interplay of nightlights, the city's texture and the curvature of the planet under sunshine causes the sparkling patterns. In the final images, the planet's halo of space traffic is faintly visible. Coruscant's twin moons were seen together in the sky during a late-night festival. The chiming of a huge clock singals three o'clock in the morning, in this time-zone. A civilisation encompassing an entire galaxy and lasting for tens of thousands to hundreds of thousands of years inevitably experiences many great natural disasters. Far beyond the groundquakes and freak weather which the surface of an inhabited planet can provide, members of galactic society will sometimes fall victim to catastrophes of astronomical origins. Cometary or asteroid impacts on an inhabited planet may occur with global or continental consequences on time-scales of hundreds of millions of years or tens of millions of years. However common galactic technology provides sufficient sensor capabilities to detect these threats well in advance, and sufficient weaponry to preemptively obliterate the potential impactors. In well-developed systems interception wouldn't even be necessary, because worlds possessing full planetary shields could simple shrug off the incoming projectile. Shipping accidents involving multi-mile cargo vessels crashing into a planet may be a greater concern than interplanetary debris. Although some kinds of interplanetary disasters are a reduced nuisance, there are interstellar events which have the potential to cause conspicuous loss of life and property. The galaxy probably suffers supernovae at a rate of about three per century. As seen from any particular planet, most of these stellar explosions are obscured from view by interstellar clouds of gas and dust throughout the plane of the spiral arms. Nevertheless the abundance of inhabited worlds ensures that each supernova will grace the skies seen by enormous numbers of galactic citizens. Of course, emissions from a supernova travel only at lightspeed, so the people in more distant systems will know when to expect to see the supernova long in advance. A star which is massive enough to go supernova has a very short lifespan, less than a few million years, so there is insufficient time for the development of indigenous life on any planets in the doomed system. Unless there is a compelling religious or economic imperative for the establishment of a colony in such a system, very few people would be directly incinerated by supernovae. However a supernova event is powerful enough to have dangerous effects in neighbouring systems, even though it cannot actually obliterate another star's planets. Deadly radiation may bake and sterilise systems which are too close, and even habitable planets in more distant systems may temporarily lose their ozone layers due to the baleful radiation. For an average inhabited planet, a supernova close enough to cause a mass-extinction event occurs roughly once in several hundred million years. However there are twelve million civilised worlds in the galaxy. This means that a typical supernova will have severe biocidal effects on one or more settled planets. Dozens of additional inhabited systems at greater distances could be rendered uncomfortable to live in. These great disasters would happen a few times per century. If the supernova is known in advance, these nearby systems could be evacuated. The Galactic Republic might have maintained statutory organisations charged with operating large evacuation fleets. Unfortunately the systems which are worst affected are also the first places to witness the event, so casual astronomical observations won't provide any helpful warnings. Early detection would depend on monitoring by astronomical probe droids near all supernova-prone stars, transmitting an alarm through hyperspace at the appropriate time. If such warning is received, the nearest systems would have a few years or decades to take action. Evacuation would be an important option in most cases. Efforts could be made to transplant living specimens representing biospheres in settled and unsettled systems in the vicinity of the supernova. As with the threat of interplanetary impacts, rich worlds would benefit from their high technology: in many cases, some kind of planetary shield might be able to protect the atmosphere until the supernova subsides. However the supernova would be likely to disrupt hyperspace shipping to the region. The galactic civilisation might develop more subtle, long-term means to deal with the supernova threat. One of the most remarkable things about the Galactic Republic (and Galactic Empire) is that there are only twelve million inhabited worlds in a galaxy with about a hundred billion systems. It is possible that this sparseness represents the conformity of patterns of settlement in response to the hazzards of space. A culture which measures its investments over tens of millennia probably is forced to develop conservative habits. Interstellar societies might deliberately avoid colonising systems which are near stars with supernova potential, no matter how pleasant the planets are. This could leave large swathes of the spiral arms in a kind of reserve status, no matter how well they're charted. 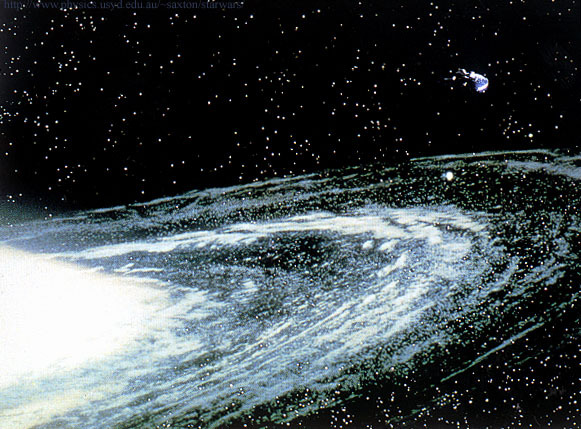 According to the novelisation of Return of the Jedi (which is canonical according to the criteria stated by the Lucasfilm continuity editors) the gas giant planet Endor vanished at some time before the historic space battle which took place in low orbit above its habitable moon. The moon, treated as a nature sanctuary under Emperor Palpatine's regime, moves in an independent planet-like orbit around its sun. This presents the observer with a curious problem: how to remove a gas-giant planet without removing its principal moon from the planetary system or even leaving it in an orbit which subjects it to inclement extremes of climate. The planet cannot have been destroyed in prehistoric times, since surveyors of the Galactic Empire or the Old Republic knew it long enough for a name to be given. 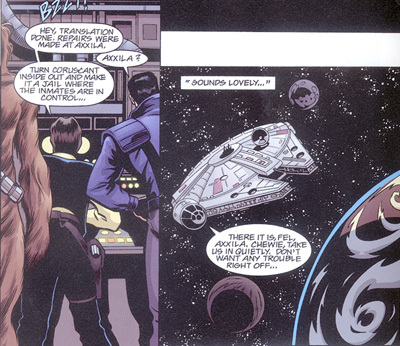 The planet was visible in the moon's sky around the time of the Battle of Naboo, as shown in the Aurra Sing comic. Therefore any explanation must also be a plausible occurrence over timescales of mere millennia or decades. Before proposing constraints on possible answers to the problem, it is first necessary to briefly defend the existence of the issue. Some authors, reflecting on the astonishing astrophysical circumstance, prefer to ignore the novel reference. This is done in the Dark Apprentice , when a young Sith initiate visits the pyre site of Lord Darth Vader. The boy perceives the presence of the planet. However his perceptions are highly suspect, since he was subject to severely obsessive emotional turmoil at the time. Furthermore, he failed to notice anything peculiar in what would inevitably be a landscape laid waste by the “nuclear winter” effect created by Death Star II debris in the moon's upper atmosphere. In any case, all post- ROTJ novels are official but not canonical; they are required to be consistent with each other but they are not an absolute basis for judgement like the films and the film novelisations. They are accepted as true only to the extent that they do not conflict with canon. Return of the Jedi and its direct physical consequences take precedence over Dark Apprentice . There is no evidence of the planet's presence in the Return of the Jedi film, and abundant evidence for its absence. A gas giant which is large enough to accommodate an Earth-sized satellite could not be missed in the sky. The planet cannot be permanently hidden on the far side of the moon. If the moon were close enough to have a synchronous orbit (preventing the planet from ever appearing in the sky on the Death Star's side) then it would loom so large that it would be seen in at least one of the space scenes, e.g. when the rebel fleet emerged from hyperspace. All directions of the sky are covered in multiple views in almost every possible direction on several different instants of the film. One other significant celestial body is seen in nearby space. 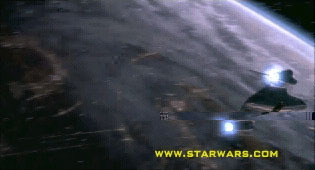 A dull brown orb is visible behind the trio of star destroyers when Lord Vader arrived at the battle station construction site, and again upon the arrival of the rebel strike team. However this cannot be the true planet Endor because it lacks the cloud patterns which were seen on the planet's face before its celestial calamity. The brown globe shows patchy areas like the basaltic “seas” of common lifeless moons. It probably is another escaped moon of Endor, gravitationally captured by its larger sibling. Alternatively, it may be a remnant of the rocky core of the former gas giant Endor. For this to be possible, we must find a plausible mechanism for removing the atmosphere. Most of a gas-giant's bulk consists of hydrogen and helium, with traces of other light gases which can only be bound to a planet which has a large total mass. If Endor was a particularly small gas-giant then it would be easier to find methods to strip it. A collision with another planetary body might knock off a large amount of gas, heat the remainder and indirectly accentuate leakage of the remainder out of the gravity well. Gradual increases in the sun's luminosity might promote leakage. Still, it is difficult to find a mechanism which is dramatic enough to disrupt a gas-giant planet and gentle enough not to harm the biosphere on the moon. Catastrophes could be devised to destroy a planet. Unfortunately, most of the obvious methods would have comparably deadly side-effects on a life-bearing moon. Whatever caused the loss of the planet must have been gentle. There almost certainly could not have been any great collisions or explosions. One possible gentle approach is an appeal to orbital chaos. Most planetary systems settle to a configuration which seems stable over periods of millions of years. Orbits evolve only very slightly. There do exist regions of any system where the celestial dynamics are conducive to unstable behaviour or the evolution of the orbital parameters in ways which defy forecasting. For instance the real orbital motion of Pluto is chaotic. The presence of perturbing influences within the planetary system may exacerbate orbital chaos or instability. Planets may be vulnerable to chaos in systems with more than one sun, or where a pair of massive neighbouring planets orbit with a simple ratio between their orbital periods. Similar considerations apply to the permanence of the orbits of moons (and in our system several of the outer moons of gas giants seem to have been lost and recaptured by their primaries). 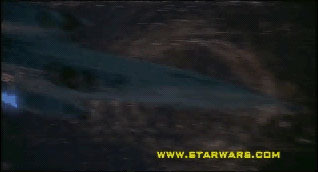 The original orbit of the Ewoks' moon was probably near the margins of the planet's influence, and it eventually slipped out of Endor's gravitational grasp, stealing the brown moon in the process. Indeed mutual perturbations of Endor and sibling moons might have been the cause of escape. The fact that Endor is a binary star system (according to the Ewoks cartoon series) means that the suns themselves may also act as sources of perturbation. Such a gentle loss is more likely to leave the sanctuary moon in a clement heliocentric orbit than would result from most imaginable violent methods of removal. The planet may still exist, but in a different orbit about its sun such that it now encounters the moon very rarely. Otherwise it might have become unbound from its star in a separate development. 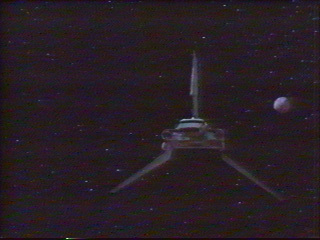 The brown moonlike body which seems to be in a system with the Endor moon. As seen when the rebel strike team arrived, it was near ”half-moon“ phase. Its position was therefore either trailing or leading the sanctuary moon in its orbit about the sun. The fact that the night side is dimly visible indicates that it is either glowing with great heat, or else it is close enough to the sanctuary moon to reflect some of its light. The latter case would mean that the orb is close and small rather than distant and large. Deep in Hutt Space, in the Y'Toub system, the planet Nal Hutta (“Glorious Jewel” in Huttese) possesses a large and singular moon named Nar Shaddaa. Both are inhabited worlds. The former is an exceptionally massive terrestrial planet with a balmy tropical climate and is the adopted homeworld of many Hutt clans. (The true Hutt homeworld, Varl, is a bleak and desolate disaster world whose inhabitants do little more than basking and bathing in seaside rock-pools.) The moon is completely smothered in dank and polluted cityscape, and serves as a base for Hutt criminal empires and home for many of the gangsters' minions. The moon is described as being one third of the "size" of the planet, but it is unclear whether this refers to diameter, surface area or volume. In any case, it is sufficiently large and close to the primary that the two worlds are tidally locked. The rotations of both bodies are matched with the orbital period, so that each keeps a constant face and position in the sky of the other. Sites on Nar Shaddaa experience two kinds of night: the normal night when the sun Y'Toub sets below the local horizon; and a shorter global night which occurs when Nal Hutta eclipses the sun. The long night is over forty hours long, implying that the full orbital period is eighty or more hours long. This is consistent with the observation that the short night lasts only a couple of hours, and the fact that Nal Hutta subtends just over ten degrees in the moon's sky. Knowing the approximate distance between the worlds (which is constant, since the orbit must be completely circularised) in combination with the orbital period would allow us to estimate the total mass of the moon and planet. (We would apply Newton's form of Kepler's Third Law.) Two passages of The Hutt Gambit hint at different values for this orbital distance. A figure of approximately 123,000km is hinted on p.304 , but a separation on the order of a light-second (three hundred thousand kilometres) or more is implied at pp.308-309 . The smaller figure yields a combined mass of 2.22 times the Earth's mass. 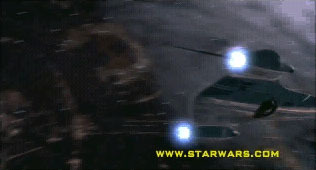 The larger figure, which is based on a risky two-second hyperdrive microjump between the worlds, indicates a mass which is sixteen or more times greater. In the small-distance case, the size of Nal Hutta in the smuggler moon's sky indicates that the planet is about 21,400km in diameter (67% greater than Earth). (The distance to the planet is about 11.5 times the planet's radius.) The planet's volume would be about 4.7 times Earth's. The corresponding figure for the total system mass (2.22 Earths) indicates that Nal Hutta has an extremely low-density, metal-poor composition. The surface gravity would be a pleasant 0.8g. The most reasonable conclusion is to adopt the smaller distance. We must assume that the two-second microjump between Nal Hutta and Nar Shaddaa was sufficiently brief that the ships spent most of the trip in pre-jump acceleration and post-jump deceleration, so that the average speed of the jump was less than lightspeed. Real asteroid fields are so diffuse that a human standing on one of the member bodies would be unlikely to discern the next nearest asteroid by eyesight. Interestingly, the asteroid field into which the Millennium Falcon escaped after the Battle of Hoth was thick enough that the pieces of celestial detritus were spaced at only a few dozen times their typical diameters. Lines of sight into space are completely blocked in the direction of the thickest asteroid distribution. At this kind of density, each asteroid must collide every few minutes. Whether the outcome is fragmentation, accretion or simply rock bouncing off rock, collisions tend to reduce the relative speeds of solid particles. Colliding asteroid pairs generally move too fast relative to each other for mutual gravity to make them stick. (Low-speed swarms of planetesimals in young star systems aggregate gently, eventually agglomerating into planets.) However the great variance of velocities in the Millennium Falcon's field is just as amazing as the high density. The density of this particular asteroid field is so extreme that large-scale regions of it should be collectively unstable to inward collapse under self-gravitation. The high swarm density is conducive to collisional damping of velocities, which will be enhanced by any further increases in local density. The asteroids should pulverise themselves into tinier, slower pieces which eventually accrete into a single larger planetoid. Left alone, the swarm could not retain its present properties for long. Whether this asteroid field was located in the Hoth or Anoat systems is in dispute; different official publications contradict each other, (eg. the novel Darksaber and the Customisable Card Game ). In The Empire Strikes Back , General Rieekan's remarks about meteor activity in the Hoth system suggests that the Falcon's belt could be there. The only reasonable partial solution is that both Hoth and Anoat have significant asteroid belts. Which asteroid belt was the one visited by the Millennium Falcon? The freighter probably made at least one unaided interstellar trip: either from Hoth to Anoat, or from Anoat to Bespin. If the asteroids were at Hoth then the freighter must have reached Anoat by means of piggyback jump while still attached to the Avenger. The Avenger may have jumped to Anoat as part of its futile search for the Falcon. 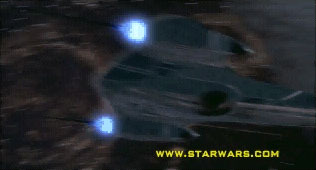 Other major asteroid fields have featured in STAR WARS fiction. Most of them are much less violent than the one seen in The Empire Strikes Back . The insectoid verpine species who manufactured the B-Wing starfighter inhabit colonies in the Roche asteroid belt. Shortly after the Battle of Yavin and at the time of Luke Skywalker's adventures with Boba Fett on a mud moon of Panna, the Alderaanian rebels operated a secret base inside a larger chunk in what was either a quiescent asteroid field or a planetary ring system. At least one major rebel base was situated in an asteroid or planetary ring particle at the time of the Talisman Incident at Panna. Title text is overlays the rocky field background. A hangar bay, open to space, is set in the face of one of the blocks which is just beyond the right edge of this illustration. Shortly after the Battle of Hoth, the crew of the Millennium Falcon took refuge from Lord Vader's fleet inside a deep asteroid cave. The cave turned out to be the interior tract of a particularly large space slug. Certain peculiar properties of the environment surrounding the freighter stirred Han Solo's suspicions, but many of the more basic properties which the refugees took for granted seem much more noteworthy form our point of view. The humans and wookiee were able to walk around outside their ship in conditions of comfortable temperature and gravity. They were surrounded by moisture and presumably unbreathable gases as well. The gases were not particularly toxic since the people were able to move around without covering their skin, eyes and other bodily surfaces. The local atmosphere was not particularly hospitable either, since lightweight oxygen masks were required. Asteroids of this kind are not supposed to posses atmosphere and their gravity must be too low to hold a walking human against the ground. The problems can probably be explained in terms of the combined action of the starslug's tissue and deliberate mechanisms of the starfreighter. For the comfort of crew making external repairs, the ship can probably extend the field of its artificial gravity beyond the hull. The Falcon's crew were able to walk around outside because they turned on external gravity over a short range around the ship, just as they would activate external floodlights to see by when repair tasks require movement outdoors. This gravity field would also help anchor the ship to the wall of the cave, and would trap and collect gases and moisture already present in the area. Waste gases would certainly be produced at some rate by the metabolism of the creature, and normally they would condense as frost on the inner walls or simply dissipate into space. Other waste gas substances or even unrecycled air might be emitted by the Falcon itself. This accounts for the non-vacuum conditions, particularly the moisture and fog. Schematic anatomy of the great starslug, not drawn to scale. Some by-products of the creature's biological processes evaporate and waft out into open space. When a starfreighter sits in the main tract, with active external artificial gravity, a local pocket of gas and moisture may accumulate. Sound does not propagate in space. Although even the depths of interstellar space are filled with a few atoms per cubic centimetre this is not enough of a medium to carry vibrations. The impact of a passing starship against these diffuse molecules will not cause an appreciable sound detectible at another craft. Crew actually hear these phenomena; they behaviorally respond as if to audio stimuli. Nearby weapon beams sound louder than distant ones. A nearby starship sounds louder than a distant one. The sound characterises the model of starship. A passing starship exhibits a Doppler shift of pitch, according to relative velocity. The most plausible explanation is that the sound is produced inside the cockpit of each starship for the benefit of crew. External radiation sensors of various kinds are linked to audio systems of the cockpit in order to provide the pilot with audible cues to the proximity of other starships and energetic phenomena, operating like a glorified Geiger-counter. A greater rate of particle detections occurs when the source is more powerful or closer; each of these contributes an audible click on internal speakers, millions of pulses received combine to give a sound which characterises the emission spectrum of the passing starship. This is an efficient use of the pilot's senses to convey vital information; the pilot's sight is likely to be preoccupied with controls and visual displays. As a technology it also has the strength of appealing to basic human intuitions about how the physical world operates. An alternative explanation for the sounds involves the starships' shields. All space vessels operating beyond the protection of the atmosphere and magnetosphere of a planet require at least some shielding to protect them from solar wind particles, etc. The shields can hug the hull, and are at least connected to the ship via their generators. It therefore seems possible that disturbances to the shields could be indirectly but physically felt through the hull or the generators. The radiation from from blaster shots or nearby sublight engines may cause resonant vibrations, heard inside the ship as sounds. The only obvious possible problem with this theory is that it doesn't seem to guarantee that the same kind of source (eg. 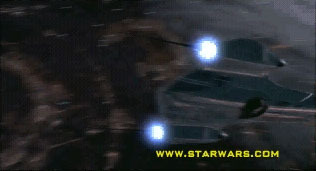 a TIE fighter) would create the same kind of noise in different ships (eg. X-Wings or the Millennium Falcon). Your sensors'll give you an audio simulation for a rough idea of where those fighters are when they're not on your screen. It'll sound like they're right there in the turret with you. From the evidence of the movies, it seems that major warships dispense with this effect, which is how the Executor, Home One and star destroyer command bridges maintain such a pure and clinical atmosphere. Of course, the ships' gunners, helmsmen and other crew who are immediately and directly concerned with outside action may have auditory sensor data fed into their helmets and headsets. In the events following the fall of the rebel base on Hoth, the Millennium Falcon was present in three different star systems, even though her hyperdrive was out of operation. The first system was the point of departure, Hoth. The second was the Anoat system, where the ship finally eluded the star destroyer Avenger and set its course for the clement giant planet Bespin, in the system of the same name. The ship must have made at least one long-distance interstellar journey. Explaining this accomplishment is very difficult considering the lack of hyperdrive. It is clear that Bespin is “pretty far” from Anoat in sublight terms, but perhaps the Anoat sun is a distant binary with that of Hoth? Even so, the trip to Bespin is interstellar. Perhaps at least part of the journey took place in one or more jumps with the Falcon attached to the tower of the Avenger. The destroyer could have taken any number of jumps, attempting to follow false leads on the Falcon's destination, before Solo considered it advantageous and prudent to drop away disguised as ejected space rubbish. If this is the case then Anoat need not be the same system as the one which contains the deadly asteroid belt. The STAR WARS Roleplaying Game introduced the notion of a &lduo;hyperdrive backup” mechanism. This is supposed to be an inefficient spare hyperdrive for use in emergencies which render the usual hyperdrive inoperative. (This device seems to have been invented for the sake of gamemasters who are not content to let their players dwell in interstellar space for years while travelling to a neighbouring system for repairs after a hyperspace mishap.) In any case, it is clear that the Millennium Falcon did not possess any kind of hyperdrive; otherwise the crew would have brought this system online in order to escape from the pursuing Imperial fighters and destroyers. The Falcon's desperation implies that it had no superluminal capability and that it made at least one short interstellar trip whilst in that condition. Typical distances between neighbouring star systems are a light year or several light years. Therefore even if Anoat and Bespin are particularly close, the Millennium Falcon must have spent at many months (probably just over a year) engaged in sublight travel, according to standard galactic time (measured on Coruscant). The ship's occupants probably did not experience so much shipboard time, since a sufficient relativistic acceleration while in transit will give rise to natural time dilation, even if starships don't come equipped with temporal compression devices akin to artificial gravity technologies. This potentially long duration has the advantage of allowing Luke Skywalker plenty of meantime for training with Yoda on Dagobah, making his evidently significant increase in Jedi proficiency seem much more realistic. After escaping Lord Vader's trap at Bespin, Luke Skywalker and his companions rejoined their portion of the rebel fleet. From the rebel medical frigate a large white disk dominated the sky to the port side. The disk was thicker and brighter towards its centre and it seemed to contain a myriad of tiny points. There is much conjecture about the nature of this phenomenon. The Topps Widevision cards refer to it simply as the "vastness of space." Unfortunately it is not possible for other references to be so circumspect; a definite identification seems necessary. Some people believe that it is the entire Galactic Empire, or else a nearby companion galaxy. This theory seems to have been adopted by Tales of the Bounty Hunters , which describes the rebel fleet resting somewhere above the galactic plane. However the object seen outside the medical clinic window is more distant than several times its own diameter; the viewers are not merely just a little way above the plane of that disk. Perhaps the bulk of Palpatine's galaxy is out of sight in the other half of the sky and the glorious vista is just a neighbouring galaxy? There is a crucial difficulty with the "galaxy" interpretation, at least with the sequence seen in the original version of The Empire Strikes Back . Viewers of The Empire Strikes Back report that the phenomenon seems to rotate visibly within only a few seconds. This spin is much too rapid for a galaxy. Motions within a spiral galaxy are of the order of up to a hundred kilometres per second, but Palpatine's galaxy is of the order of a hundred thousand light years across. As pointed out in The Cosmic Mind Boggling Book , the observed rotation would equate to rotational speeds on the rim reaching at least "the impossible velocity of 33 billion times the speed of light". The object seems too bright to be a galaxy. When viewed from a distance great enough to account for the observed size, a spiral galaxy would look like a dim milky disk to the naked eye. It would have the same kind of luminance as the shine of the open sky on a moonlit night. 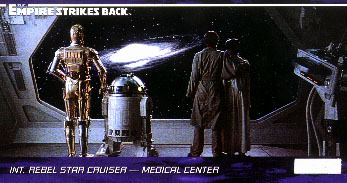 From a vantage point inside a brightly-lit medical theatre, a spiral galaxy would be harder to see than the blazing entity at the end of The Empire Strikes Back . If it is galaxy-sized, the object must be a quasar or some other exotic active extragalactic entity which just happens to be in the neighbourhood of Palpatine's galaxy. A normal galaxy also exhibits overall colour variations due to regional differences in stellar populations. The galactic core should be a somewhat redder hue, and the disk bluer. It is not certain whether the object is colourful enough to be a normal spiral galaxy. This object's morphology also seems a bit unusual for a sprial galaxy. The arms are too tightly wound, and the nucleus is proportionately too large. On the other hand, it might be a galaxy which has suffered a gravitational encounter with another galaxy, which could distort its shape. There may be other galaxian possibilities capable of explaining the shape of this object; maybe it is some kind of nearby dwarf galaxy. Other commentators assert that it must be a protostellar disk, a cloud of gas and dust collapsing under gravity to form a new planetary system with a sun at its centre. Or it might be some kind of accretion disk surrounding a black hole or other compact strong gravitating body. Or it might be something yet more exotic, perhaps even something which exudes matter as it rotates, rather than accreting stuff. However it is not clear whether the structure and colouration suits a protostellar disk or accretion disk either. A protostar should be surrounded by dusty molecular cloud material, not open space as seen in the film. The observed rotation is less ludicrous for these smaller kinds of objects than for an entire galaxy, but it is still very problematic. Effects unit art director Joe Johnston prepares a model nebula for photography. 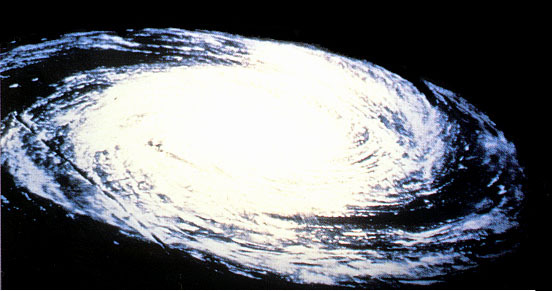 The swirling star formation was filmed with a slight rotation and incorporated into the final sequence. The novel The Mandalorian Armour supports a nebula interpretation, since it describes a similar "spiral nebula" near the Kuat system and remarks that there are several of these objects in the galaxy. This topic remains unconcluded; it is possibly the most severe technical difficulty in the whole trilogy. The mysterious white object looks something like a spiral galaxy viewed from above its primary plane. The diagonal gap across the disk in the second image is damage to the special effects model, and does not appear in the film. A few droids and humans of the Rebel Alliance gaze through a particularly large viewport on their medical frigate. They sight the wonders of the cosmos. Before the Storm , Michael P. Kube-McDowell, Bantam. Behind the Magic , LucasArts. The Black Fleet Crisis Frequently Asked Questions List , http://www.sff.net/K-Mac/black.htm, Michael P Kube-McDowell, [not endorsed by Lucasfilm]. Bounty Hunters: Aurra Sing , Dark Horse Comics. CINEFEX #2 , August 1980, p.8. Children of the Jedi , Barbara Hambly, Bantam. The Crystal Star , Vonda McIntyre, Bantam. Dark Apprentice , Kevin J. Anderson, Bantam. Dark Empire , Tom Veitch & Cam Kennedy, Dark Horse Comics. The Dark Empire Sourcebook , Michael Allen Horne, West End Games. Darksaber , Kevin J. Anderson, Bantam. Fantastic Films Collectors Edition #21 , pp.32-35, The STAR WARS Star Slug , Clyde Jones, Blake Publishing Corp.
A Guide to the STAR WARS Universe , 2nd edition, Bill Slavicsek, Del Rey. Heir to the Empire , Timothy Zahn, Bantam Books. Heir to the Empire Sourcebook , Bill Slavicsek, West End Games. The Hutt Gambit , Ann C. Crispin, Bantam. The Illustrated STAR WARS Universe , Ralph McQuarrie & Kevin J. Anderson, Bantam. The Imperial Sourcebook , Greg Gorden et.al, West End Games. Jedi Search , Kevin J. Anderson, Bantam. The Last Command , Timothy Zahn, Bantam. One Will , television advertisement for The Phantom Menace , Lucasfilm Ltd. The Paradise Snare , A.C.Crispen, Bantam. Planets of the Galaxy: Volume One , West End Games. Shadow Stalker , Ryder Windham et al., Dark Horse Comics. Shield of Lies , Michael P. Kube-McDowell, Bantam. STAR WARS I: The Phantom Menace , George Lucas et al, Lucasfilm Ltd.
STAR WARS I: The Phantom Menace: Trailer , Lucasfilm Ltd.
STAR WARS IV: A New Hope , George Lucas et.al., Lucasfilm Ltd.
STAR WARS Chronicles , Deborah Fine & Aeon Inc., Virgin Books. STAR WARS Customisable Card Game , Decipher Inc.
STAR WARS Insider , issue #42. STAR WARS Episode I: Scrapbook , Ryder Windham, Random House. STAR WARS Episode I: Visual Dictionary , David West Reynolds, DK Publishing. STAR WARS IV: A New Hope , Radio Drama, Brian Daley, Del Rey. STAR WARS V: The Empire Strikes Back , George Lucas et.al., Lucasfilm Ltd.
STAR WARS Holiday Special cartoon, Nevana Studios. STAR WARS VI: Return of the Jedi , James Kahn, Del Rey. STAR WARS VI: Return of the Jedi , George Lucas et.al., Lucasfilm Ltd.
STAR WARS Official Site , http://www.starwars.com, Lucasfilm Ltd. The STAR WARS Roleplaying Game (second edition, revised and expanded) , Bill Smith et al., West End Games. Tales of the Bounty Hunters , ed. Kevin J. Anderson, Bantam. Tales of the Jedi: The Sith War , Kevin J. Anderson, Dark Horse Comics. Topps Widevision: The Empire Strikes Back , Topps. Vector Prime , R. A. Salvatore, Del Rey. Vision of the Future , Timothy Zahn, Bantam. X-Wing Rogue Squadron: Masquerade , #30-31, Michael A. Stackpole et al., Dark Horse Comics. Extrasolar Planets Encyclopaedia , http://www.obspm.fr/planets, Jean Schneider, Observatoire de Paris. Extrasolar Visions , http://www.empire.net/~whatmoug/Extrasolar/extrasolar_visions.html, John Whatmough. The Cosmic Mind Boggling Book , Nick McAleer, Warner Books, 1982. US Census Bureau: Quick Facts, https://www.census.gov/quickfacts/, USA Government. Original content is © copyright Curtis Saxton 2001. Online since 18 June 1997. Last updated 7 January 2001. Images included in or linked from this page are copyright Lucasfilm Ltd. and are used here under Fair Useage terms of copyright law.